Double Sided ATG Adhesive Transfer Tape is a premium quality double-sided tape that comes with pressure-sensitive adhesive with great holding power and high initial adhesion. The tape works as a cost-effective replacement to staples, bolts, rivets, liquid adhesives and screws. The tape is versatile, quick-acting, convenient and easy to use. The product is way safer than hot melt adhesives and helps you get your work done without leaving any mess. Double Sided ATG transfer tape works on a variety of surfaces and materials and bonds fast on contact. 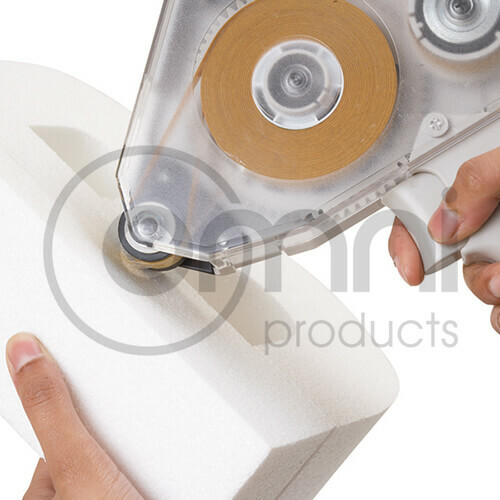 With the application of just a little bit of pressure on the hand-held applicator, the tape is applied, rewinding the liner as soon as you release it, making the whole process neat and fuss-free. The tape can be used for assembling posters, creating promotional items, pasting items even on glossy surfaces, attaching pictures to a scrapbook, mounting frames on the wall, gift wrapping, and several other tasks. With a quick application of this nifty adhesive tape, see your work and designs come together seamlessly to deliver the results you want. Double Sided ATG Adhesive Transfer Tape is available in different sizes, making it easy for you to select the most suitable option and use as per your requirements.